Compare coffee beans from Harris, Caffe Aurora, Vittoria, Lavazza, Grinders and Coles, on taste, aroma, value for money, texture, packaging, variety and overall satisfaction. 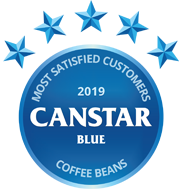 Harris has been rated best in Canstar Blue’s consumer ratings for coffee beans. The brand earned five-star reviews on taste, value for money, texture, packaging, variety and overall satisfaction. It was four stars for aroma. A great coffee begins with great coffee beans – and there’s almost nothing better than the aroma of freshly ground coffee brewing in the morning. Whether you’re after a rich, dark roasted coffee with an intense flavour, or something lighter with zesty notes, there’s plenty of choice to satisfy your taste buds. But with endless options available, the wrong choice might leave you with a sour taste. So, if you want the scoop on which brand hits the spot, you’ve come to the right place. More than 500 coffee enthusiasts took part in our ratings to tell us their opinions about the brand they have recently purchased and enjoyed (or otherwise). There were a number of factors the coffee beans were grinded with, including taste, aroma, value for money, texture, packaging and variety. Six brands received the minimum sample size to be included in our inaugural 2019 coffee bean review, but only one achieved a five-star rating for overall satisfaction – Harris. The brand got five stars in all rated variables except for aroma, where it got four stars. Caffe Aurora, Vittoria, Lavazza and Grinders all got four stars for overall satisfaction, while Coles was left on three stars. Notably Caffe Aurora and Vittoria were the only two brands to achieve five stars for aroma. In addition, Caffe Aurora also got five stars on value for money, texture, packaging and variety alongside this year’s winner. Our survey also revealed that more than half (56%) of consumers have to have a coffee in the morning to help start their day. Around half (51%) generally buy the same brand, and 42% go out of their way to buy the coffee they like. A third (32%) prefer home-brewed coffee over a barista made while two in five (43%) make it at home to prevent spending money in a cafe. For over 135 years, Harris Coffee Roasters has prided itself on its locally roasted coffee range, the brand says. It states that only when the team has given the tick of approval in the tasting room at the roastery in Sydney, can Harris coffee be freshly packed and delivered across Australia. It offers a range of medium and dark roasted coffee blends including its Signature Blend, Espresso and Premium Crema. Depending on the blend, they are available in 1kg beans or ground and 200g ground packs. Canstar Blue surveyed 3,000 Australian adults across a range of categories to measure and track customer satisfaction, via ISO 26362 accredited research panels managed by Qualtrics. The outcomes reported are the results from customers within the survey group who have purchased coffee beans (whole beans or ground) to brew at home in the last 3 months – in this case, 503 people.